The toggle above switches between a brightness temperature difference field and a GOES-R IFR Probability field (both from MODIS) over Missouri and Kansas (including the busy airport in Kansas City). The cirrus shield over the convective complex over Missouri obscures any satellite view of low clouds. North and west of that cirrus shield, over Nebraska, Kansas and Iowa, the brightness temperature difference indicates clouds comprised of water droplets (that is, stratus or fog). Ceilings and visibilities underneath the cirrus canopy, and within the stratus deck show regions of IFR conditions. Rapid Refresh model data that is part of the GOES-R IFR Probability algorithm is able to alert a viewer (or forecaster) to the possibility of Fog/Low stratus in areas underneath the cirrus. Probabilities under the cirrus canopy are lower because satellite-based predictors are not used in the computation of probabilities. This entry was posted in MODIS, Plains on July 30, 2013 by Scott Lindstrom. Fog and low stratus developed over the High Plains under easterly (upslope) flow in the early morning hours of July 29, 2013, and the GOES-R IFR Probability fields ably discriminated between regions of stratus and visibility-restricting low stratus/fog. Note in the imagery above how the Brightness Temperature Difference field (upper right) includes a strong signal over eastern Nebraska where visibility restrictions/low ceilings are not present. Fusing the satellite data with Rapid Refresh model data allows the MODIS and GOES-based GOES-R IFR Probability fields to more accurately depict the regions of low visibilities/ceilings. Note that the brightness temperature difference product from MODIS, below (Lower Right), also highlights the mid-level stratus over eastern Nebraska. This entry was posted in MODIS, Plains on July 29, 2013 by Scott Lindstrom. 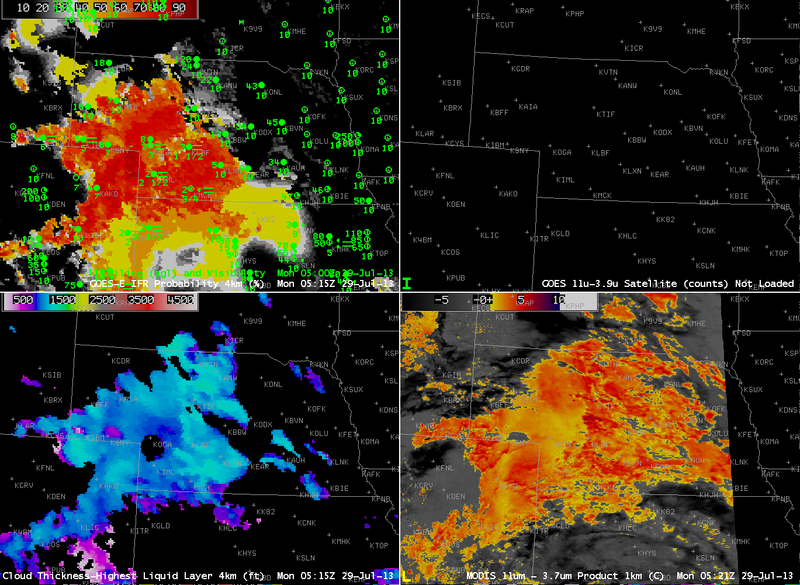 GOES-R IFR Probabilities computed from GOES-West (Upper Left), GOES-West Brightness Temperature Difference (10.7 µm – 3.9 µm) (Upper Right), GOES-R Cloud Thickness from GOES-West (Lower Left), GOES-R IFR Probabilities computed from MODIS (Lower Right), hourly from 0500 through 1200 UTC on 23 July 2013. Hourly GOES-R IFR Probabilities ably capture the creep of low fog and stratus into Puget sound from the north — through the strait of Juan de Fuca, and from the south, with low clouds eventually surrounding the Olympic Mountains. Part of the input into the GOES-R IFR Probability algorithm is the brighness temperature difference shown in the upper right, and note that it used alone overpredicts where low clouds/fog might be occurring. Including Rapid Refresh data allows the GOES-R algorithm to restrict — correctly — the IFR conditions to where they are most widespread. Suomi-NPP data from the VIIRS instrument includes a Day/Night band that on July 23rd, when the moon was approaching full, neatly outlines both the cloudy regions — where moonlight is reflected off clouds — and those regions where light is being emitted (that is, cities). As above, but with the VIIRS Day/Night band in the bottom right, at 0923 and 1103 UTC. Suomi/NPP VIIRS data also includes 10.8 and 3.74 µm imagery, so a brightness temperature difference product can be computed (work is in progress to incorporate Suomi/NPP data into the GOES-R algorithm suite so an NPP-based IFR probability can be developed. The toggle below compares the day/night band data with the brightness temperature difference produce at 0923 UTC. This entry was posted in Pacific Northwest, Suomi/NPP on July 23, 2013 by Scott Lindstrom. GOES-R IFR Probabilities (Upper Left) computed from GOES-East data, Brightness temperature difference (GOES-East, 10.7 – 3.9 ), GOES-R Cloud Thickness (Lower Left), Suomi-NPP Day/Night Band (Lower Right). All images hourly, 0515 UTC through 1115 UTC on 22 July 2013. When fog forms overnight because of radiational cooling to the dewpoint, the thickness of the fog is related to the time it will take for the fog to dissipate. In general, thick fog dissipates more slowly than thin, and because thick fog is generally surrounded by thinner fog, a region of fog/low stratus will generally erode from the outside in. The animation above shows the gradual development and expansion of fog overnight over Iowa, Illinois and Missouri, with thicknesses over southeastern Iowa eventually reaching values of 1100 feet! The relationship between time of dissipation and fog depth is shown on this chart, where the depth is the last pre-twilight image. For 22 July 2013, that image is at 1045 UTC, shown below. A value of 1100 feet corresponds to a dissipation time of 2-3 hours after sunrise. The visible animation, below, shows dissipation between 1400 and 1500 UTC. Suomi/NPP data showed a snapshot of the fog development in this region at ~0800 UTC. As above, but with a toggle of the Day/Night band and a Brightness Temperature Difference, all imagery at 0802 UTC 22 July 2013. This entry was posted in Day/Night Band, Dissipation Time, Midwest, Suomi/NPP on July 22, 2013 by Scott Lindstrom. The resolution and view angle of MODIS, compared to the GOES Imager, means that smaller features are better resolved and more accurately navigated. In the example above, the Kickapoo River in Vernon, Richland and Crawford Counties in southwest Wisconsin is clearly delineated in the MODIS product, with a small ribbon of values from 800-1000 feet, but not in the GOES where values are closer to 600. Differences along the coast of Lake Michigan are also evident. MODIS detects a thick cloud bank off the coast of Sheboygan County (the cloud thickness is near 1000 feet); GOES detection has thicknesses of 800 feet in that region, but the values are shifted onshore because of parallax and the co-registration error that exists between the 10.7 µm and 3.9 µm channels on the GOES-13 Imager. If you are using Cloud Thickness to estimate fog dissipation, the difference between 1000 and 800 feet equates to 60-90 minutes. This entry was posted in Cloud Thickness, Wisconsin on July 9, 2013 by Scott Lindstrom. 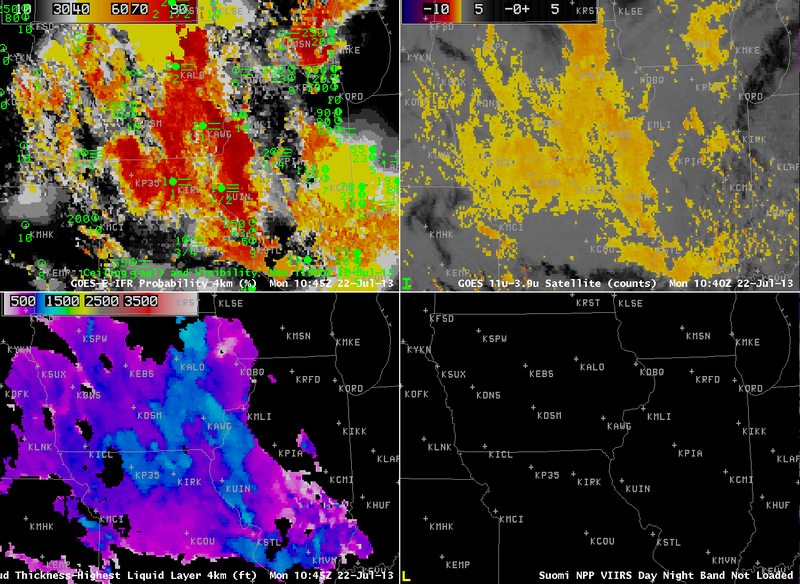 GOES-R IFR Probabilities show a characteristic increase over central Illinois as radiation fog develops in the early morning hours of July 5 2013. Probabilities are initially low, but gradually increase, and spread, as the fog develops. The IFR probability field over Tennessee, Indiana and Kentucky has the characteristic flat look of a field produced mainly from model fields: the probability field is flat, and IFR probabilities are low. There are regions — such as near Nashville at the end of the animation — where the field includes satellite data; IFR Probabilities there are larger and the IFR Probability field has a more pixelated appearance. There a several things of note in the image above. IFR Probability field in central Illinois have higher values south of the peak in the brightness temperature difference field, where the lowest visibilities and ceilings are reported. GOES-R Cloud Thickness is unavailable in regions underneath the high clouds in the eastern part of the imagery — over Tennessee and Kentucky, except where there are holes in the clouds. Note how these regions of diagnosed GOES-R Cloud Thickness overlap with regions of pixelated GOES-R IFR Probability fields. In both fields, Satellite data are being used for the computation. This entry was posted in Cloud Thickness, Midwest, Multiple Cloud Layers on July 5, 2013 by Scott Lindstrom.